Roulette in French means "the little wheel" and the game was invented in the eighteenth century. The present form of the game is even mentioned in a novel, La Roulette, Ou Histoire D'un Joueur, by Jacques Lablee. In the book, the writer describes the slots on the wheel, and how two were reserved for the bank so that they had the mathematical advantage. The game came to Germany in 1843, where it was introduced by François and Louis Blanc. Two variations of the game, French with a single "0", and American with a double zero are the most popular versions. Each requires a different Roulette strategy. Roulette is quite a simple game if you get to understand how the numbers work in the game. The first step is to know the different wheels used in the game. Most wheels have numbers ranging from 0 to 36. In the French and European versions of the game, there is a single zero, while the American version has a double zero. The croupier who controls the game, starts by rolling the white ball and spinning the wheel after all the bets have been placed. The Roulette bets themselves are placed on the numbers on a table, which is in sync with the numbered slots where the ball can land. The Roulette table has numbers arranged in a manner which also has to be understood. The numbers from 1 to 36 are listed in three groups, each containing 12 numbers. This grouping is known as 1st 12, 2nd 12 and third 12. These numbers are also placed in two groups of 18 where the groupings are 1-18 and 19-36. The other groups visible on the Roulette table are even, odd, black and red. There are two kinds of Roulette bets that can be placed, which are known as "inside bets" and "outside bets". The inside bet requires anticipating the type of pocket the ball will land in, or the actual number it will land on. The inside bets on Roulette can be "Straight Up" on one number with a pay ratio of 35:1, "Split Betting" on two numbers with the pay ratio of 17:1 or "Street Bet" on three numbers with a pay ratio of 11:1. There is also a "Corner Bet" on four number with a pay ratio of 8:1 and "Line Betting" on six numbers with a payout of 5:1. In each case, chips are used to place bets which lie on the rows or numbers required. In the American version, there is an additional bet on 5 specific numbers 0,00,1,2,3 with a pay ratio of 6:1. The outside betting is done with the colours red or black and even or odd numbers, with a payout ratio of 1:1. The Roulette wheel normally has 37 numbers, 0 - 36. The Roulette table has the same numbers arranged in rows and groups. Outside bets are placed on odd or even numbers or the colours red and black. Inside bets are placed on numbers or groups of numbers. 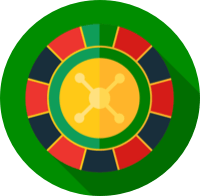 The Roulette wheel is different in the European and American versions, and you should always take note of this when placing roulette bets. The numbers from 1 to 36 are painted red and black alternately on the table and the wheel, while the zero is mostly green. The first rule of Roulette is the minimum and maximum bets that can be placed, and this will vary with each table. These are normally displayed on the table itself. The bets are either placed by the player or the croupier, depending on which kind of game you are playing. The "En Prison" rule is applied to even bets, which means that if the ball lands on zero, then the player loses half their wager. The second of the special Roulette rules is known as "La Partage". Here, if the ball lands on zero, any even-money bets are split and half your bet is returned. Roulette is a game of chance and luck, but there are many different strategies employed by players. First and foremost, you should ensure that you read all the rules for each game and understand the house edge. For instance, French La Partage brings the house edge down to just 1.35%, The second Roulette strategy to increase the chances of winning, is to do some practice by playing on a free table until you are confident. The third strategy is to always opt for the European or French version of the game, as it has better odds for the player than the American version. When playing the online version of Roulette games, make sure to play only at a reputable casino. Knowing how much to bet on a Roulette game is the next strategy to maximise your chances of a win. Set aside the amount of money you can afford to lose and always stick to that. This strategy will help to minimise any losses, which is a win, isn't it? As you win, always withdraw the profits. For example, if you have bet 200 and the table gives 300 back, then withdraw the profit amount of 100. Continue playing with the original amount of 200. This way you are actually collecting profits and counting wins, which definitely makes a difference. Check the Roulette game for the house edge. Play on a free table to get the feel of the game. Always play the European or French version of Roulette. There are three different versions of Roulette played in land based and online casinos. The American version of the game has two variations of zero, which includes a single zero ("0") and a double zero ("00"). Thus, the wheel will have 38 slots. The European version of the game has 37 slots, which include the numbers 1 to 36 and a single zero. The third version is the French version which has the same wheel as the European version, however, the table is arranged in columns rather than rows. All these games are played using chips of different colours. Unlike other table games played with chips, the chips do not have any value on them, only the table number. After the game is finished, the chips are exchanged for cash chips which can then be exchanged for money with the cashier. You can play an automated Roulette online, or try your hand in the exciting live casinos. Roulette is simply fun to play if you know the game and can be very addictive. Beginners should be very careful and follow a strategy to win. Remember that any wheel gives more even number results than odd numbers, so always bet on even numbers. Inside bets are better for seasoned players who have experience, so try to stick to outside bets while learning the game. With the internet, beginners now have the advantage of watching live games as an audience and learning by watching the experts in action. Read as many reviews, tips and tricks as you can before playing for real money. Biased Numbers: The numbers that continue to repeat on a wheel due to a biased wheel. Croupier: An employee of the casino who operates the Roulette table. House edge: The advantage of the casino making profits on each bet placed. Parlay: When a player bets on the table and adds more for the next spin. Five number bet: The bet placed on five specific numbers 0, 00, 1, 2, and 3. This is possible only in American Roulette. What are the advantages of playing online Roulette? Online Roulette has many advantages and the major ones are (1) You save travel money by playing from home (2) You can play for small stakes (3) You can change casinos by just logging into another casino (4) You can play whenever you want without the fear of the casino closing. How does the zero and double zero give odds advantage to the casino? Roulette is played in two versions. The American version has two zeros and the European version has a single zero. The casinos will pay 35:1 on one number bets and here they have the advantage. You are placing a bet on 37 or 38 numbers. So, if you win a 1 bet, then you get 36. Losing means the loss is 37 which is a 1 profit for the casino. What about the betting systems in Roulette? Do they work? To put it in simple terms, Roulette does not follow the rules of probability and hence no betting system really works. The game is totally random and one spin has no effect on the next one. Hence, it is impossible to accurately guess the upcoming number. Yes, you can employ a strategy but will it work? Well, it is pure luck! Roulette is one of the games featured in the Aboutslots gaming guides. These guides provide information about how to play the game, the rules of the game, different strategies which can increase the chances of a win and some useful tips for new players. Log in today, read up, and enjoy playing online games of all kinds.